One of the many condo communities at Gainey Ranch, the Golf Cottages community consists of 48 units lined along the #1 and #2 fairways of the Lakes Golf Course. Every unit has a golf course view! You’ll find single level condos as well as 2-story townhouse models. And there’s a second floor unit as well that makes you feel like you’re living in a treehouse! You can choose from 2 bedroom, 2 bath plus den floor plans at 1800 square feet or 3-bedroom, 3 bath units at 2100 square feet. Whichever you choose, you are never more than a 2 minute walk to the marvelous Estate Club with its Olympic pool (heated year round), the tennis center with 7 courts, the gym and fitness center, and the media room. 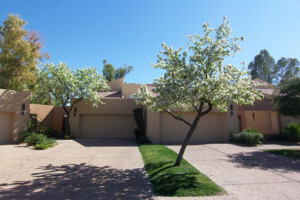 Make Gainey Ranch your choice for Scottsdale resort living!